The recipe serves a medium-sized dog one meal. 1. Cut carrots into small pieces. Place potatoes and carrots into a pot and cover with water. Bring to a boil, and simmer for 8 minutes, or until fork tender. Drain and cool the mixture until room temperature. 2. Crack eggs into a small bowl and whisk. Microwave for 30 seconds, and stir to mix. Microwave for another 30 seconds, or until eggs are set. Cool until room temperature. 3. 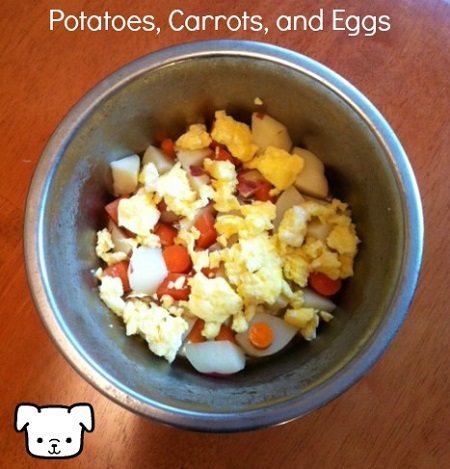 Combine potatoes, carrots, and eggs and serve.